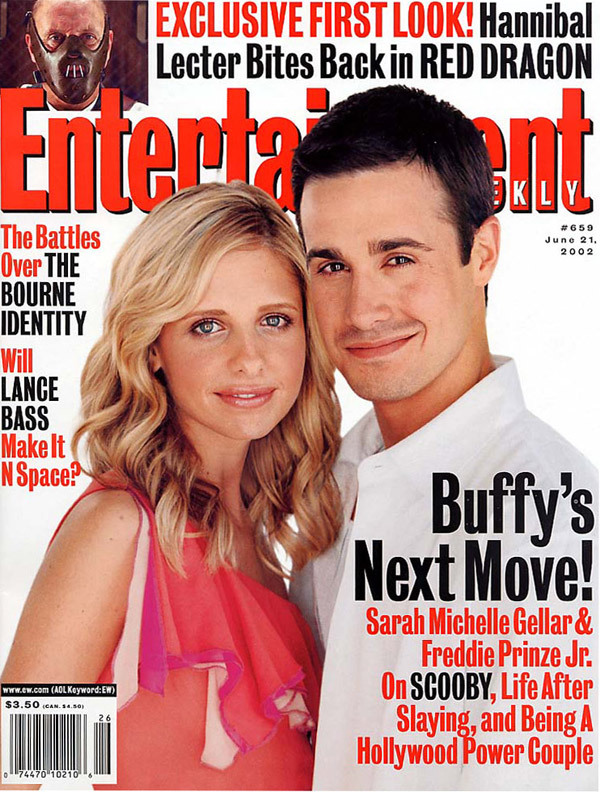 Sarah Michelle Gellar, the stake-wielding star of ''Buffy the Vampire Slayer,'' and her fiancé, Freddie Prinze Jr., Mr. ''She's All That,'' are as mismatched as grilled-eggplant-and-chocolate-syrup sandwiches -- the favorite meal of Shaggy, the scruffy sidekick in the couple's latest collaboration, ''Scooby-Doo.'' Gellar wakes before 6:30 a.m.; Prinze can doze until noon. She reads Oprah's Book Club selections; he devours comic books. She loves to travel; he kissed the ground upon returning from the five-month-long ''Scooby-Doo'' shoot in Australia. Her series is humming along; after working the teen-romance circuit, he's in search of a new thing. It was also a shoot Gellar would have endured alone, had she not forced her significant other to read the script. Prinze -- who was such a fan of the cartoon he had every episode on tape and owned a Scooby bowling ball -- admits that at first he hated the idea of a live-action version. ''I didn't want to have anything to do with it,'' he says. ''But she was just like, 'Read the script, Freddie. It's a genius script [by fledgling scribe James Gunn].' I read it and laughed out loud so many times...I called my agent and went in the very next day,'' says Prinze. The couple were cast within days of each other as Daphne and Fred, joining Matthew Lillard, Prinze's frequent partner in teen high jinks, as Shaggy, and Linda Cardellini (''Freaks and Geeks'') as Velma. Copyright © 2002 Entertainment Weekly Magazine. All rights reserved.